MJX Bugs 3 Drone Review 2019 – is the MJX Bugs 3 quadcopter worth the money? Review of features, pricing, flight duration, battery, camera and more. The MJX Bugs 3 is a remote-controlled drone with a Gimbal mount to hook a GoPro or other action camera. This means the unit is ideal for anyone looking to fly a drone capable of taking a GoPro to the sky for breathtaking shots from previously impossible angles. It is equipped with specially designed brushless motors that are known for generating low friction. The motors also come with a heat reduction system, thus extending the battery life by 50 percent. The powerful MT1806 1800KV brushless motors allow you to have a high-performance drone ready to fly and capture images. It is controlled by a remote control that operates at a frequency of 2.4 GHz for a continuous transmission up to 1,600 feet away. The 1,800 mAh battery ensures between 15 to 20 minutes of flight on a single charge, which can be easily removed and replaced with a second compatible battery. This provides a surefire way to extend flying time. 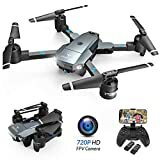 This drone is available on platforms like Amazon at a reasonable price. Disassembling the upper frame is a breeze thanks to the included magnet screwdriver. The battery life is decent, which allows users to enjoy impressive speed and responsiveness that one would not have expected. With the Bugs 3’s battery, you can fly between 15 to 20 minutes alternating speed and also perform Flip maneuvers. Despite the two fake antennas, the radio control is adequate, thus allowing users to control the drone up to the maximum distance without problems. In addition to the classic functions to control this quadcopter, many MJX Bugs 3 drone review articles show that users like the button to turn on and off the LEDs. The same applies to the dedicated buttons to turn on and off the engines, adjust the speed, take pictures and videos and switch from angle to acro mode or vice versa. Thanks to the brushless motors and the 6-axis Gyroscope, you can have a good compromise in terms of speed, acceleration and stability during flight. This makes the drone really enjoyable. When you are ready to switch to Acro mode or do Flip even in Angle mode, you are sure to feel the exhilaration. Another plus point for the MJX Bugs 3 is the size. One of the biggest problems with drones is the size and the immediacy of flight. 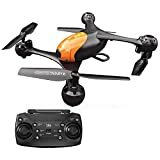 Thanks to the compact size of the drone, one can always carry it around, turn on the radio control and the drone will start flying immediately. If you have done everything correctly, you will have to push the red button with the padlock to start the drone engines. To raise the drone, move the left stick upwards. 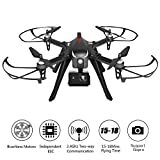 You are ready to fly the drone and perform amazing maneuvers or capture images. Many customers praise the drone’s speed and maneuverability. Novices are happy with the unit’s capabilities, which make it easier to learn and practice flying. This is a major confidence booster for many beginners. 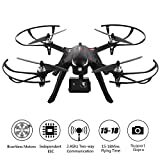 As mentioned above, this drone is sold together with an accessory that allows you to hook a GoPro, XiaoYi or any other action camera that measures 62 x 44 x 25 mm. The product is built to absorb most of the vibrations, which ensures that filming is smooth and without jolts. The MJX Bugs 3 Drone compares favorably with other units in its class thanks to the wide range of key features. It sees the light after the success of the previous models and it is sure to keep the positive feedback coming from the large community of fans. The model is equipped with a camera hold, 2.4GHz remote control technology, FPV flight and more. The MJX quadricopter is a medium-sized drone (10 x 10 x 5 inches) and medium weight (3.4 pounds). It is built using the classic ABS type plastic. The 4-channel radio remote control transmits in 2.4GHz allows a decent control range. 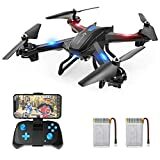 The 7.4V 1800mAh batteries guarantee a real flight time of about 20 minutes and are recharged in two and a half hours, thanks to the supplied charger. By downloading the app for Android and IOS, you can pilot our model via mobile or tablet and see in real time what the camera of the drone is capturing (FPV). Unlike the MJX Bugs 5W, the Bugs 3 is not equipped with an 8MP camera capable of filming in Full HD 1080p and taking pictures in JPEG format. However, attaching an external camera allows users to capture shots that are smooth and stabilized thanks to the dedicated Gimbal mount. The Bugs 3 also comes with LED lights that allow control even in conditions of poor visibility. With FPV, it is possible to see in real time what the drone is capturing via a mobile phone. In flight, the Bugs 3 is a fantastic drone. It pilots beautifully and is easy to control, thanks to decent features. Its precision is demonstrated by the fluidity in the movements, which is one of the elements that many users like about this model.